The Executive Vice-Chairman, Nigerian Communications Commission (NCC), Professor Umar Garba Danbatta was at the weekend honour with an award as the "Telecom Personality of the Year” at the 2016 Nigerian Telecom Lecture and Awards (NTLA) reports ITRealms. This is coming as the Director, Public Affairs at NCC, Mr. Tony Ojobo has said that Public Relations and Government Communications Management is indispensable in today's governance. 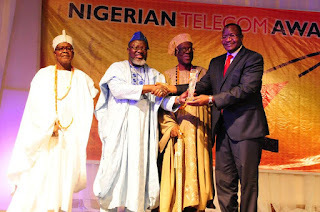 The award ceremony which held Lagos, was heralded with lecture and serves as a platform to discuss and interact for the benefits of exchanging ideas about how to improve the telecoms industry in Nigeria. ITRealms gathered that Barrister Adebayo Shittu, Honourable Minister of Communications was the distinguished guest of honour, while the Chairman of the event was His Imperial Majesty, Oba Enitan Ogunwusi, Ojaja II- The Ooni of Ife. Meanwhile the Commission participated in the 16th NECCIPR Roundtable with the theme: Unleashing the Power of Public Relations, which held recently with Mr. Ojobo as one of the resource persons. Speaking on Managing Public Relations and Government Communications in the Age of New Media: Issues, Challenges, Opportunities and Implications for Career Development for the Emerging Practitioner, Ojobo posited that Public Relations and Government Communications Management is indispensable in today's governance. According to him, the Public Sector must create platforms for feedback on policies and decisions and believes that Government Communication must always be timely and strategic.